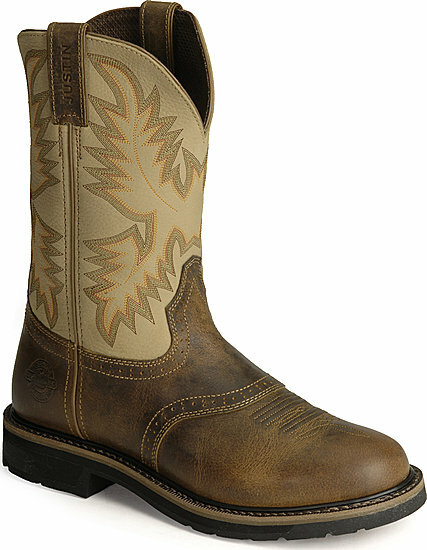 This Justin Stampede Superintendent Work Boot Features A Rugged Tan Leather Foot Under A Fancy Stitched 11" Creme Leather Shaft. Mesh Fabric Lining. Comfort Taped Inside Seams. J-Flex Comfort System For Maximum Energy Return; Shock-Absorbing Gel Heel Pad. Removable Orthotic Insert. Supportive Steel Shank. Reinforced Saddle Vamp. Rugged Dual-Density Midsole And Performance Storm Welt. 1 1/4" Stockman Heel.